Dan (K7IA) and Andy (KK7AC) at Dan's base camp for his 7QP portable operation at approximately 8000' elevation in Apache County Arizona on Friday before 7QP. Had a lot of fun activating 26 Idaho counties, one Wyoming county,and two Oregon counties. The long version can be found here: https://tinyurl.com/WW7D-2017-7QP. I didn't get to do a county line expedition again this year, but I was well set up at home with an extra 40/20 meter ground plane antenna. Fortunately, Murphy only showed up with poor band conditions on 20 meters --so bad that I did errands for a few hours in the early afternoon and returned to take advantage of first 40 and then 80. 80 meters was amazing, netting contacts clear out to the east coast as the night wore on. My QSO count, which had gone stagnant at midday, really took off as the evening wore on and 80 stretched out. It was great fun, as always. Conditions were different, not a lot of Qs found on 10 or 15. 20 was a good source for a while, and 40 was good. What happened to all the folks on 160 or 80? This was our first 80 degree day... was tough to stay on the radio, with is so pretty outside, but it still beats snow! Great to see that some folks are hearing well, and thanks to all that helped make this another FUN time. See you in the next test too!! Good idea to make the logs compatible across all the QPs. Only problem is I have no idea what my score is but guess I will find out when you post them. GL sorting it all out. Mediocre daytime propagation, blue skies and sunshine outside, and S5 powerline noise, limited my activity during the day. But at sundown, the noise lifted and 40m was hopping! I don't often get a chance to work west coast stations from my QTH in VA in an HOA restricted community. This was a good opportunity for me to work some new states and counties. Where was MT Montana? Not a single call was heard! It was great to hear the bands with shoulder to shoulder CW. Noise here was a bit better than normal. All in all it was a great opportunity to blow the dust out and keep the wheels turning! Lots of rural electric QRN, I am sure that I missed several who called, sorry that I could not pull you through. Conditions, especially to EU were very good, and it was a pleasure to be able to work the folks there. As a Rover on rural MT and WY roads, it is a real challenge to try hitting the correct keys on the little notebook PC keyboard. I am sorry for the many typing mistakes, but that is part of the game. My score was not as high as last year, as I had several visits from OM Murphy, despite my careful preparations. Also that is as always, part of the game! I mostly chased my good friend K7RE/M as Brian rode, while Joanna drove, through WY and MT. He gave me a number of new counties--thanks! I also chased new counties and S&P'd a few stations for fun. I had planned a M-S County Expedition in AZ but both my wife and I came down with the crud. I'll be back next year. Fun out of proportion to the short time on the air. 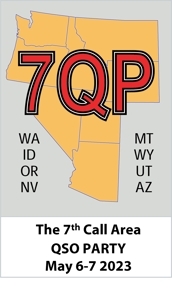 We really appreciate all the 7-land QSOs. Great contest! Surprised at the level of CW activity. Already looking forward to next year. Band conditions were the best on the low bands. Many thanks for all the activity from the Seventh Call Area.